Right eye of a 28-year-old female with subarachnoid hemorrhage 1 week after intracranial surgery. Left eye of a 28-year-old female with subarachnoid hemorrhage 1 week after intracranial surgery. The pathogenesis of Terson syndrome has been controversial. The earliest reports assumed that the intracerebral blood directly connected with the intraocular space through the lamina cribrosa. While electron microscopy of the optic nerve anatomy has not demonstrated a communication between the 2 spaces, one case report has demonstrated bilateral optic nerve sheath hemorrhages following rupture of an anterior choroidal artery aneurysm resulting in a Terson syndrome. Pathological specimens have not shown any blood in the optic nerve sheath within 3 mm of the globe. A case series of Terson syndrome patients was analyzed with scanning laser ophthalmoscopy, which revealed blood spreading along vessels. The data, combined with SD-OCT results and intraoperative observations of those Terson syndrome patients, suggest that blood may enter the vitreous cavity around the retinal vessels surrounding the optic disc. Because of these assumptions regarding the pathogenesis of the syndrome, the definition of Terson syndrome now includes any intraocular hemorrhage associated with intracranial bleeding and acutely increased intracranial pressure. Attempts have been made to correlate Terson syndrome with the intraocular hemorrhages seen in shaken baby syndrome because of the similarity in clinical findings in the eye and the brain, but acute tractional forces may be an additional factor contributing to the intraocular hemorrhage in the latter. The neurologic symptoms are related to intracranial bleeding. Reported visual acuities range from 20/20 to light perception, but they often are difficult to obtain secondary to the impaired neurologic status of the patient. The degree of visual loss is related to the degree and extent of the intraocular hemorrhage. The intraocular hemorrhage is often bilateral and superficial to the retina. Intraretinal or subretinal hemorrhages have been reported but are less frequent. However, these may be more difficult to diagnose in the setting of vitreous or subhyaloidal hemorrhage. 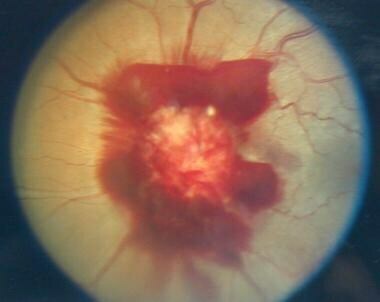 Preretinal hemorrhage can develop into vitreous hemorrhage weeks after the initial inciting event. [10, 24, 25] The intraocular hemorrhage may be difficult to diagnose immediately because the ophthalmologist may be restricted from dilating the patient for neurologic monitoring. A decreased red reflex can be helpful in evaluating a patient who is comatose, and B-scan ultrasonography can further establish the extent of vitreous hemorrhage in lieu of a dilated funduscopic examination. The relevant anatomy in Terson syndrome includes the inner retinal vasculature, choroidal vasculature, chorioretinal anastomoses near the optic nerve head, and subarachnoid space surrounding the optic nerve. Contraindications for a vitrectomy include a small intraocular hemorrhage with a high likelihood of spontaneous clearing or an intraocular hemorrhage that is already spontaneously clearing. Patients with Terson syndrome are often poor surgical candidates because of the severity of the intracranial hemorrhage and often do not survive the devastating event. Litten M. Ueber einige vom allegmein-klinischen Standpunkt aus interessante Augenveranderungen. Berl Klin Wochnschr. 1881. 18:23-27. Hoving EW, Rahmani M, Los LI, Renardel de Lavalette VW. 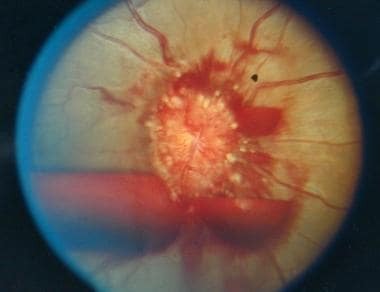 Bilateral retinal hemorrhage after endoscopic third ventriculostomy: iatrogenic Terson syndrome. J Neurosurg. 2009 May. 110(5):858-60. [Medline]. Khan SG, Frenkel M. Intravitreal hemorrhage associated with rapid increase in intracranial pressure (Terson's syndrome). Am J Ophthalmol. 1975 Jul. 80(1):37-43. [Medline]. Medele RJ, Stummer W, Mueller AJ, et al. Terson's syndrome in subarachnoid hemorrhage and severe brain injury accompanied by acutely raised intracranial pressure. J Neurosurg. 1998 May. 88(5):851-4. [Medline]. Vrabec TR, Sergott RC, Savino PJ, et al. Intermittent obstructive hydrocephalus in the Arnold-Chiari malformation. Ann Neurol. 1989 Sep. 26(3):401-4. [Medline]. Pagani-Estévez GL, Chen JJ, Watson JC, Leavitt JA. Acute Vision Loss Secondary to Epidural Blood Patch: Terson Syndrome. Reg Anesth Pain Med. 2016 Mar-Apr. 41 (2):164-8. [Medline]. Gupta V, Kolomeyer AM, Bhagat N, Turbin RE, Prestigiacomo CJ, Gandhi CD. Subarachnoid hemorrhage-negative Terson syndrome after balloon-assisted coil embolization in a patient with underlying antiphospholipid antibody syndrome. Retin Cases Brief Rep. 2014 Summer. 8 (3):171-4. [Medline]. Jing XB, Sun LQ. Terson syndrome with no cerebral hemorrhage: A case report. Exp Ther Med. 2014 Jan. 7 (1):251-253. [Medline]. Wang YM, Nudleman E, Vinocur D, Kuo DJ. Terson Syndrome Before Induction Chemotherapy for Acute Lymphoblastic Leukemia. J Pediatr Hematol Oncol. 2018 Mar. 40 (2):141-142. [Medline]. Ko F, Knox DL. The ocular pathology of Terson's syndrome. Ophthalmology. 2010 Jul. 117(7):1423-9.e2. [Medline]. Czorlich P, Skevas C, Knospe V, Vettorazzi E, Richard G, Wagenfeld L, et al. Terson syndrome in subarachnoid hemorrhage, intracerebral hemorrhage, and traumatic brain injury. Neurosurg Rev. 2015 Jan. 38 (1):129-36; discussion 136. [Medline]. Seif GI, Teichman JC, Reddy K, Martin C, Rodriguez AR. Incidence, morbidity, and mortality of Terson syndrome in Hamilton, Ontario. Can J Neurol Sci. 2014 Sep. 41 (5):572-6. [Medline]. Ness T, Janknecht P, Berghorn C. Frequency of ocular hemorrhages in patients with subarachnoidal hemorrhage. Graefes Arch Clin Exp Ophthalmol. 2005 Sep. 243(9):859-62. [Medline]. Pfausler B, Belcl R, Metzler R, et al. Terson's syndrome in spontaneous subarachnoid hemorrhage: a prospective study in 60 consecutive patients. J Neurosurg. 1996 Sep. 85(3):392-4. [Medline]. Stienen MN, Lücke S, Gautschi OP, Harders A. Terson haemorrhage in patients suffering aneurysmal subarachnoid haemorrhage: a prospective analysis of 60 consecutive patients. Clin Neurol Neurosurg. 2012 Jul. 114 (6):535-8. [Medline]. Frizzell RT, Kuhn F, Morris R, et al. Screening for ocular hemorrhages in patients with ruptured cerebral aneurysms: a prospective study of 99 patients. Neurosurgery. 1997 Sep. 41(3):529-33; discussion 533-4. [Medline]. Fahmy JA. Fundal haemorrhages in ruptured intracranial aneurysms. I. Material, frequency and morphology. Acta Ophthalmol (Copenh). 1973. 51(3):289-98. [Medline]. Gauntt CD, Sherry RG, Kannan C. Terson syndrome with bilateral optic nerve sheath hemorrhage. J Neuroophthalmol. 2007 Sep. 27(3):193-4. [Medline]. Heyreh SS. An experimental study of the central retinal vein occlusion. Trans Ophthalmol Soc UK. 1964. 84:586-98. Ogawa T, Kitaoka T, Dake Y, et al. Terson syndrome: a case report suggesting the mechanism of vitreous hemorrhage. Ophthalmology. 2001 Sep. 108(9):1654-6. [Medline]. Michalewska Z, Michalewski J, Nawrocki J. Possible methods of blood entrance in Terson syndrome. Ophthalmic Surg Lasers Imaging. 2010 Nov-Dec. 41 Suppl:S42-9. [Medline]. Fahmy JA. Fundal haemorrhages in ruptured intracranial aneurysms. II. Correlation with the clinical course. Acta Ophthalmol (Copenh). 1973. 51(3):299-304. [Medline]. Schultz PN, Sobol WM, Weingeist TA. Long-term visual outcome in Terson syndrome. Ophthalmology. 1991 Dec. 98(12):1814-9. [Medline]. McCarron MO, Alberts MJ, McCarron P. A systematic review of Terson's syndrome: frequency and prognosis after subarachnoid haemorrhage. J Neurol Neurosurg Psychiatry. 2004 Mar. 75(3):491-3. [Medline]. He T, Wu LN, Chen B, Xing YQ. [Incidence and relative factors of Terson syndrome in patients with aneurysmal subarachnoid hemorrhage]. Zhonghua Yan Ke Za Zhi. 2011 Dec. 47(12):1096-101. [Medline]. Garweg JG, Koerner F. Outcome indicators for vitrectomy in Terson syndrome. Acta Ophthalmol. 2009 Mar. 87(2):222-6. [Medline]. Sharma T, Gopal L, Biswas J, Shanmugam MP, Bhende PS, Agrawal R, et al. Results of vitrectomy in Terson syndrome. Ophthalmic Surg Lasers. 2002 May-Jun. 33(3):195-9. [Medline]. Garcia-Arumi J, Corcostegui B, Tallada N, et al. Epiretinal membranes in Tersons syndrome. A clinicopathologic study. Retina. 1994. 14(4):351-5. [Medline]. Lee SH, Seo JH, Park SH, Won YH, Ko MH. Terson Syndrome in Aneurysmal Subarachnoid Hemorrhage: A Case Report. Ann Rehabil Med. 2015 Aug. 39 (4):640-4. [Medline]. Gnanaraj L, Tyagi AK, Cottrell DG, et al. Referral delay and ocular surgical outcome in Terson syndrome. Retina. 2000. 20(4):374-7. [Medline]. Sayman Muslubas I, Karacorlu M, Hocaoglu M, Ersoz MG, Arf S. Anatomical and functional outcomes following vitrectomy for dense vitreous hemorrhage related to Terson syndrome in children. Graefes Arch Clin Exp Ophthalmol. 2018 Mar. 256 (3):503-510. [Medline]. Bäuerle J, Gross NJ, Egger K, Neubauer J, Niesen WD, Buttler KJ, et al. Terson's Syndrome: Diagnostic Comparison of Ocular Sonography and CT. J Neuroimaging. 2016 Mar. 26 (2):247-52. [Medline]. Bäuerle J, Gross NJ, Egger K, Neubauer J, Niesen WD, Buttler KJ, et al. Terson's Syndrome: Diagnostic Comparison of Ocular Sonography and CT. J Neuroimaging. 2016 Mar-Apr. 26 (2):247-52. [Medline]. Kuhn F, Morris R, Witherspoon CD, et al. Terson syndrome. Results of vitrectomy and the significance of vitreous hemorrhage in patients with subarachnoid hemorrhage. Ophthalmology. 1998 Mar. 105(3):472-7. [Medline]. Rubowitz A, Desai U. Nontraumatic macular holes associated with Terson syndrome. Retina. 2006 Feb. 26(2):230-2. [Medline]. Shaw HE Jr, Landers MB, Sydnor CF. The significance of intraocular hemorrhages due to subarachnoid hemorrhage. Ann Ophthalmol. 1977 Nov. 9(11):1403-5. [Medline]. Toosi SH, Malton M. Terson's syndrome--significance of ocular findings. Ann Ophthalmol. 1987 Jan. 19(1):7-12. [Medline]. Weingeist TA, Goldman EJ, Folk JC, et al. Terson's syndrome. Clinicopathologic correlations. Ophthalmology. 1986 Nov. 93(11):1435-42. [Medline].